National Geographic Society Explorer in Residence Dr. Sylvia A. Earle, called Her Deepness by the New Yorker and the New York Times, Living Legend by the Library of Congress, and first Hero for the Planet by Time Magazine, is an oceanographer, explorer, author and lecturer with experience as a field research scientist, government official, and director for corporate and non-profit organizations including the Kerr McGee Corporation, Dresser Industries, Oryx Energy, the Aspen Institute, the Conservation Fund, American Rivers, Mote Marine Laboratory, Duke University Marine Laboratory, Rutgers Institute for Marine Science, the Woods Hole Oceanographic Institution Research, National Marine Sanctuary Foundation, and Ocean Futures. 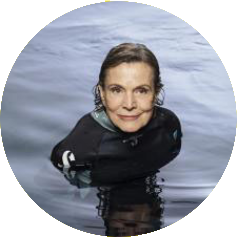 She has led more than 100 expeditions and logged more than 7000 hours underwater including leading the first team of women aquanauts during the Tektite Project in 1970, participating in nine saturation dives, and setting a record for solo diving in 1000 meters depth. Her research concerns marine ecosystems with special reference to exploration, conservation, and the development and use of new technologies for access and effective operations in the deep sea and other remote environments. Her more than 100 national and international honors include the 2011 Royal Geographical Society Gold Medal, 2009 TED Prize, Netherlands Order of the Golden Ark, Australia’s International Banksia Award, Italy’s Artiglio Award, the International Seakeepers Award, the International Women’s Forum, the National Women’s Hall of Fame, American Academy of Achievement, Los Angeles Times Woman of the Year, and medals from the Explorers Club, the Philadelphia Academy of Sciences, Lindbergh Foundation, National Wildlife Federation, Sigma Xi, Barnard College, and the Society of Women Geographers.